We are all home on this Wednesday. Our thermometer still shows -14 and the wind chill is -45. It is cold and windy with snow blowing. We are staying pretty warm here in the house. It is a little cooler in here than other days with that strong wind blowing outside. We hardly see any traffic go by. Joe’s RV factory shut down for the rest of the week and school was closed all week, so far. My surgery was rescheduled for next week because of the cold weather. Its so nice to not have to go outdoors today. Joe and the boys did the chores and the horses are in the barn for the day. It sure wouldn’t take long to get frostbite in these temperatures. Sunday the temperature was mostly in the single digits. Our daughter Lovina stayed home from church with Kevin with his cast since it was cold and snowing. Church families all brought gifts to church for Kevin, and my sisters Verena and Susan brought them to him after church. He received many nice things to pass the time while he’s in his cast. The kindness from everyone was greatly appreciated! Our church had five new babies born in December and January. Four boys and one girl. Grandson Timothy, and a little one named Caleb made their first appearance in church. The other babies that we still didn’t get to see are Titus, Jayden and Velda. On Monday daughter Elizabeth had a doctor appointment. We had the joy of watching baby Timothy and two-year-old Abigail while mommy went to her appointment. Timothy did really well for us; we had lots of fun holding him and of course spoiling Abigail. Some of the Eicher beef will likely end up in a tasty and warming pot roast such as this, or beef stew for a cold day. Last Friday Tim, Elizabeth and children, Mose, Susan and Jennifer came to cut up the beef quarters we gave to them. Lovina and Kevin went to school. Verena and Loretta watched the little ones here in the house while Joe, sons Benjamin and Joseph and I helped Tims’ and Moses’ with the beef. Hamburger was ground and packaged, steaks cut and sliced, beef chunks and hamburger processed. Mose also made some beef bologna to put in cans and process. We were all tired by evening but so glad to have it all done for them. I remember how hard it was to get things done with little ones to care for. 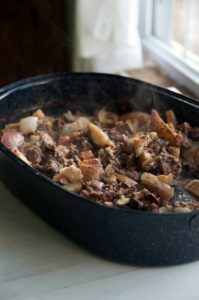 We had a casserole for supper and I made rare beef for everyone after we were done. Tims left for home and Mose and Susan decided to spend the night here and wait to take their meat home in the morning. Susan and I put on a few more pressure cookers the next morning from the jars of meat that didn’t get canned the day before. We had four pressure cookers going, so it went fast. It was so nice to do all this outside in the heated pole barn. I remember having to cut up beef in the house and what a mess it was to clean up. Now this is so much easier. The hot water pipe froze out there, so we had to heat some water, but the cold water worked and the bathroom still worked. We need to do some more insulating out there for colder winters. Kevin received a few puzzles among the gifts sent from church so we are going to start a 1000 piece this week. I have some mending I need to do yet, but I enjoy putting together 1000 piece puzzles. If we look only at the work waiting, we would never do anything else. I will share a recipe for rigatoni and cheese casserole I made for supper Sunday evening when Tims’, Moses’, and Dustin were here. I didn’t have mozzarella cheese so I used Colby and it still tasted good. I used fresh hamburger that was ground on Friday. As I write here by the kitchen table, I cannot believe how cold that wind sounds outside. Stay warm and safe everyone! God’s blessings to all! Preheat oven to 350 degrees. In saucepan over medium heat, brown beef. Then add pasta sauce and seasoning. Cover and simmer for 20 minutes. In a separate bowl, combine cottage cheese with 1 cup mozzarella cheese, parmesan cheese, and eggs. 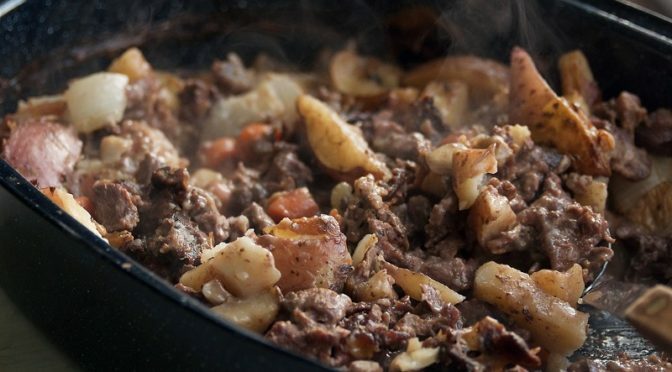 Grease a 13×9-inch baking dish and spread 1 cup of the pasta sauce/beef mixture over the bottom. Top with half the noodles, cheese mixture and repeat in layers until everything is used up. Sprinkle remaining 3 cups of mozzarella cheese over top. Bake uncovered 45 minutes or until bubbly. Makes 10–12 servings. Lovina’s Amish Kitchen is written by Lovina Eicher, Old Order Amish writer, cook, wife and mother of eight. Her newest cookbook, The Essential Amish Cookbook, is available from the publisher, Herald Press, 800-245-7894. Readers can write to Eicher at PO Box 1689, South Holland, IL 60473 (please include a self-addressed stamped envelope for a reply); or email LovinasAmishKitchen@MennoMedia.org and your message will be passed on to her to read. She does not personally respond to emails. Amish cookingAmish recreationKevin's surgeryLovina EicherLovina's Amish KitchenRigatoni and Cheese CasseroleThe Essential Amish Cookbook: Everyday Recipes from Farm and Pantry.